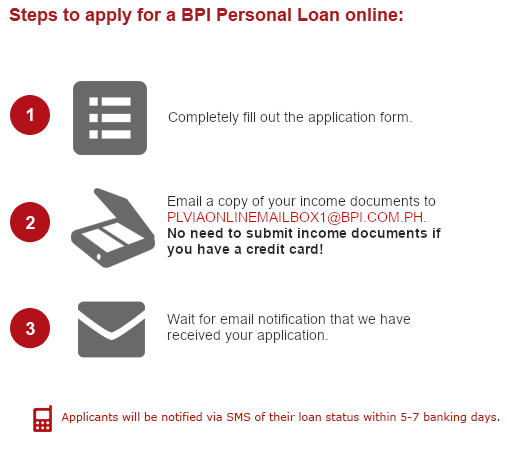 BPI | Promos | BPI PERSONAL LOAN: NO PROCESSING FEE! 1.This promo is exclusively offered to all clients who will apply for a BPI Personal Loan on March 1 to April 19, 2019. 2.The loan must be booked until April 26, 2019 only. 3.The loan amount must be at least Php 150,000, and availed at 36 months term. 4.All applications received after the 5PM encoding cut off on March 1, 2019 will no longer be qualified for this promo. 5.All applications received after the 5PM booking cut off on April 26, 2019 will no longer be qualified for this promo. 6.Clients who will apply for BPI Personal Loan Seafarer Program and/or BPI Personal Loan Employee Program are not qualified. 7.Standard application requirements and credit policies for BPI Personal Loan shall apply.